RANDALL’S ISLAND — Get away from the city without leaving the five boroughs. The Randall’s Island Park Alliance is hosting a free cherry blossom festival Saturday from 11 a.m. to 3 p.m.
Now in its third year, a couple of thousand people are expected to attend the free festival, she added. Activities include live music, face painting and kite flying. There will be a food truck and a vendor with a grill but people are encouraged to bring their own picnic. More than 100 cherry blossom trees are spread out over the park. People can grab a map and explore the waterfront or more central areas of the park, Maher said. The forecast calls for partly cloudy skies and a slight chance of showers with a high of 68 degrees, according to the National Weather Service. 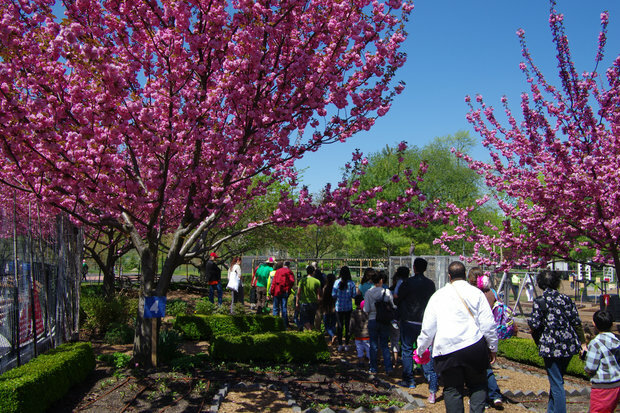 The cherry blossom festival is one of the first free events the park is hosting this year. It will also have movie screenings, urban farming days, and other family-friendly events throughout the year, Maher added.